Just because the bathroom is a necessity doesn’t mean it can’t reflect your sense of style! Home Furniture Mart offers a wonderful selection of bathroom vanities and double vanities that can brighten any bathroom. Each of the bathroom vanities or double vanities offered we offer is of the highest quality. As always, our bathroom vanities and double vanities are all at prices you can afford! Don’t settle for a bathroom that just gets the job done! 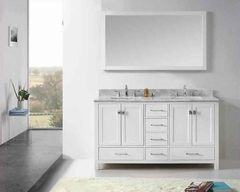 Start shopping our selection of bathroom vanities today!